The Preliminary Design of a structure begins with the district submitting a Bridge Survey indicating their need for a structure, and ends with the completion of the Substructure Layout or TS&L submittal (type, size and location). This article is intended to be a guide for those individuals assigned the task of performing the Preliminary Design or “laying out” of a structure. In addition to the following information, the Preliminary Design shall consider hydraulic issues where applicable. The Preliminary Design process starts with the receipt of the Bridge Survey. The following is a list of steps that are taken by the Bridge Survey Processor. The Bridge Division assigns bridge numbers in Bloodhound to all new, rehabilitated or modified structures (i.e., bridges, box culverts (see EPG 750.7.4.3 Summary of Responsibilities), CIP retaining walls over 5 ft. tall and MSE walls adjacent to bridge end bents). Enter the Bridge Number, survey received date and feature crossed in the Bloodhound database. New timber bridges are numbered in the same manner using the letter “T” instead of the letter “A”. Temporary bridges use the same number as the new bridge with the letter “T” added to the end (i.e., the temporary bridge for A8650 would be A8650T). Structures without a suffix letter on the existing bridge number will be numbered using the existing bridge number and a suffix number added that corresponds to the number of rehabilitations or modifications to the structure (i.e., bridge number A0455 becomes A04551 upon its first rehabilitation or modification and A04552 upon its second). Structures that have the suffix “R” on the bridge number are usually bridges that have been rehabilitated or modified in the past, but in some cases bridges were given the suffix “R” to denote it as a replacement for a bridge with the same number. Review the existing bridge plans to determine if the “R” was for a rehabilitation or replacement. Structures that have been previously rehabilitated should replace the “R” with a suffix number corresponding to the total number of rehabilitations to the structure (i.e., bridge number A0444R would become A04442 (second rehab. or mod. ), bridge number A0055R2 would become A00553 (third rehab. or mod. ), etc.). For structures where the “R” denotes it as a replacement, the suffix number corresponds to the number of rehabilitations or modifications and the “R” is dropped (i.e., bridge number L0428R becomes L04281 for the first rehabilitation). If the “R” suffix was removed in a previous rehabilitation, the next suffix number is used regardless if the original structure was a rehabilitation or replacement. Twin structures with the same bridge number will use a different suffix number for each structure. The numbering is similar to a single structure with the lower suffix number being used on the eastbound or southbound structure and the next suffix number being used on the westbound or northbound structure (i.e., bridge number A0144 would become A01441 for the eastbound bridge and A01442 for the westbound bridge. A future rehabilitation would become A01443 for the eastbound bridge and A01444 for the westbound bridge). Twin bridges with an “R” suffix on the bridge number would receive the suffix numbers using the same rules, but with the same consideration given to the “R” as it is for a single structure. Rehabilitations that consist only of structural steel coatings use the existing bridge number plus the suffix “-Paint” (i.e., bridge number A2100 would become A2100-Paint and bridge number A150010 (multiple rehabilitations) would become A150010-Paint). A future rehabilitation consisting of only structural steel coatings would use the suffix “-Paint2” only if no other rehabilitations have been completed since the previous coating rehabilitation. When a bridge structure is removed and not replaced by a new bridge structure or is removed under a separate contract, the suffix “-Remove” should be added to the latest bridge number (i.e., bridge number T0415 would become T0415-Remove and bridge number K01651 would become K01651-Remove). Bridge numbers that were assigned to new structures that were never built are only reused if the proposed structure is at the same crossing location that the bridge number was originally assigned to. Bridge numbers that were assigned to rehabilitate or modify structures where the work was not completed may reuse the previous bridge number by adding the suffix “-#2” to the bridge number (i.e., bridge number A6545 had plans developed for deck repairs and was assigned the bridge number A65451, but the work was never completed. 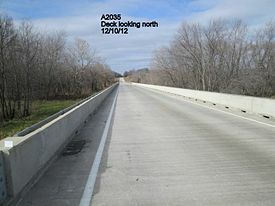 At a later date, bridge A6545 is set up to be redecked; the bridge number assigned to the redeck would be A65451-#2). This suffix is only recorded in Bloodhound for tracking purposes and is not shown as part of the bridge number on file folders or final plans. Outer (pink label) County, Route and Job No. Correspondence County, Route and Job No. Preliminary Design County, Route, Bridge No., Location and Job No. Also, be sure to notify by email the Structural Resource Manager and the appropriate Structural Project Manager or Structural Liaison Engineer, if known, when a new Correspondence File is created. The email subject line should include the Job No., County, Route and Bridge No. Include the name of the Bridge Division contact in the email, either the Structural Project Manager or the Structural Liaison Engineer. For structures over streams or waterways, calculate the drainage area and length of stream. Generate a drainage summary and include this information along with a map showing the drainage area for the structure and the area surrounding it in the Preliminary Design folder. If the drainage area is less than 1.5 sq. miles, consult the Structural Resource Manager to determine if preliminary design by the Bridge Division is necessary. The accuracy of the drainage area should be to the nearest 0.1 sq. mile for drainage areas less than 10 sq. miles and to the nearest 1 sq. mile for drainage areas greater than or equal to 10 sq. miles. When another stream intersects the subject stream near the downstream side of the proposed structure, create a separate drainage summary for the intersecting stream and include it in the Preliminary Design folder. When the electronic files listed in EPG 747.1.2 Bridge Survey Submittals are received, verify that the drawing scales are correct and that the necessary reference files are included. Also, review all Bridge Survey Sheets and the Bridge Survey Checklist for accuracy and completeness. The Bridge Survey Processor may have to work with the district to correct any discrepancies and/or omissions. Add the newly assigned bridge number to the files and place a hard copy in the layout folder. Once all of these steps are completed, the Bridge Survey Processor should deliver the Correspondence File, outer folder and the Preliminary Design Folder(s) to the Structural Resource Manager. An acknowledgement email is sent to the district contact(s) informing them that the Bridge Division has received the Bridge Survey. The email subject line should include the Job No., County and Route. Include the Bridge No(s). and the name of the Bridge Division contact in the email. Once the survey is found to be complete and accurate, the Survey Complete date should be entered into Bloodhound. This date should match the Surv Rec date if no changes were made. If the survey is not complete or contains inaccuracies as submitted, we need to work with the district to fill in the blanks. If the omissions affect the timeline for completing the preliminary design, the Survey Complete date should reflect the date when we have all the information needed for the preliminary design to move forward without delay. If there is a delay in the bridge division review of the survey, this time should not count against the district in the survey complete date. The Bridge Survey Processor should work closely with the preliminary designer and SPM to determine the proper Survey Complete date in this case. For example, a bridge survey is received on 9/16/2016. Initial review by the bridge survey processor shows a complete survey. The job sits for five weeks while a preliminary resource comes available. Review by the preliminary designer shows a profile grade that is unusable and the preliminary design cannot progress until the grade situation is corrected. It takes four weeks for the grade to get worked out. The Survey Complete date should be four weeks after the Surv Rec date (10/14/2016). The district would not be penalized for our five week delay in reviewing the survey. This date is important because it will help us track when bridge surveys are turned in relative to when they are complete and when the project is due to Design. The Preliminary Designer should meet with the Structural Project Manager to go over the Correspondence and Preliminary Design files to see if anything out of the ordinary has come up at Core Team Meetings prior to that date. It is important to include any correspondence or calculations used in the laying out of the structure in the bound portion of the Preliminary Design Folder. The Preliminary Designer should then examine the Bridge Survey closely for any errors or omissions. Consult EPG 747 Bridge Reports and Layouts. Pay special attention to the scales used. Make sure the district's submittal includes photographs and details of staging and/or bypasses, if applicable. Verify that the proposed roadway width meets the NBI criteria for minimum bridge roadway width to avoid building a deficient bridge. Contact the district to resolve any discrepancies or questions. A visit to the bridge site by the Preliminary Designer may be warranted to help determine Manning’s “n” values, examine adjacent properties, etc. If you decide to make this trip, advise the Structural Project Manager and the district contact since they may also want to attend. Laying out a bridge should consider deck drainage concerns for bridges on flat grades and sagging vertical curves and other vertical alignment issues as given in EPG 230.2 Vertical Alignment and EPG 230.2.10 Bridge Considerations. The interests of other agencies must be considered in the evaluation of a proposed stream-crossing system; cooperation and coordination with these agencies must be undertaken. Coordination with the State Emergency Management Agency (SEMA), the U.S. Coast Guard, the U.S. Army Corps of Engineers, and the Department of Natural Resources is required. U.S. Coast Guard permits for construction of bridges over navigable waterways. Section 404 permits for fills within waterways of the United States from the U.S. Army Corps of Engineers. Section 401 Water Quality Certification permits from the Missouri Department of Natural Resources. Floodplain development permits for work in special flood hazard areas from the State Emergency Management Agency (SEMA). Section 404 and Section 401 permits are obtained by the Design Division. U.S. Coast Guard permits are obtained by the Bridge Division. The Bridge Division will obtain floodplain development permits for projects that include structures in a regulated floodplain. The Design Division will obtain floodplain development permits for other projects involving roadway fill in a regulated floodplain. Copies of approved U.S. Coast Guard permits and floodplain development permit/applications are sent to the district, with a copy to the Design Division. See MoDOT and the Environment for more information on the required permits. The end slopes are determined by the Construction and Materials Division and are supplied to the Bridge Division by way of the Preliminary Geotechnical Report. If this report is not in the Correspondence file, contact the district to get a copy of it. The Bridge Division has made a commitment to the districts that we will have the bridge plans, specials and estimate completed 12 months after the date the Bridge Survey and Preliminary Geotechnical Report are received. The "12 month clock" does not start ticking until both the Bridge Survey and the Preliminary Geotechnical Report are in the Bridge Division. When laying out a skewed structure, adjust the end slope for the skew angle. On higher skews, this will have a significant effect on the lengths of the spans. Often the slope of the spill fills will be steeper than the roadway side slopes. On a skewed structure, this makes it necessary to "warp" the slopes. Whenever there will be a berm under any of the spans, its elevation should be such that there is a minimum of 4 feet clear between the ground line and the bottom of the girder as shown below. If a rock cut is encountered in the spill slope, a slope of 1:1 may be used to the top of the rock. The purpose of wings is to contain and stabilize the abutment fill as the roadway transitions to the bridge. For stream crossings in particular, the wings also protect the abutment during extreme hydraulic events. The lengths of the wings at the end bents are to be determined prior to the issuance of the Bridge Memorandum. There are two reasons for this. First, the district will use these lengths to determine the placement of their guardrail (bridge anchor section). Second, if the lengths of the wings exceed 22 ft., they will have to be broken into a stub wing and a detached wing wall. If this happens, then you will need to include this extra cost in your Preliminary Cost Estimate and request soundings for the wall. The request for soundings for the wall should include a request for the determination of the allowable bearing of the soil (if in cut - assume piling if it is in fill) and the angle of internal friction for the material retained by the detached wing wall. Also include the bottom of wing footing elevation. Wing lengths at each end of a bridge could be unequal because of several factors: grade of roadway under, superelevation of bridge, skew of the bridge, and/or other ramps/roads/slopes adjacent to the bridge structure, e.g., stream access roads or unusual geomorphic conditions. Set/determine the wing lengths using the control points, as shown in Embankment at Bridge Ends, which may be used for both grade separations and stream crossings. This is done after the end bent location is determined. If estimated wing lengths are within 3 ft., they should be made equal and based on the longer wing length. Make sure no slope is steeper than that recommended in the geotechnical preliminary report. Slightly flatter slopes are acceptable. The contractor will warp the slopes to fit the wing tip locations. Equal wing lengths are preferable at stream crossings to mitigate scour, improve erosion control and improve/mitigate parallel water flow along wing and side embankment. Also, since wing lengths are reported to districts for use in estimating rock slope protection limits, unequal lengths (especially on the upstream side) could mistakenly lead to the unfavorable condition of allowing for less than adequate rock side slope protection. Judgement is required since no two estimated wing lengths at a bridge end will be exactly equal. More often equal wing lengths are used. On divided highway bridges with high skews and shallow end slopes, the wing lengths on the median side of the bridge may be less than the other side due to the difference in sideslope between the median and the outside. On box culverts, the actual live load applied to the structure is dependent upon the amount of fill on top of the box; however, see Structural Project Manager for the live load that goes on the Bridge Memorandum. Determining the most appropriate skew angle for the structure involves some judgement. On bridges over streams, pick the angle that will allow floodwater to pass through the bridge opening with the least amount of interference from intermediate bent columns. Another consideration on meandering streams is to avoid a skew which will cause the spill fill – side slope transition from blocking the stream. Often a trip to the field may be justified just for determining the angle (you can even ask the district to stake some different skews for you to observe in the field). On stream crossings, avoid skews between zero and five degrees and try to use five degree increments. On grade separations, often the skew must be accurate to the nearest second to maintain minimum horizontal clearances. Keep all bents on a bridge parallel whenever possible and avoid skews over 55 degrees. Also keep in mind that the higher the skew, the higher the Preliminary Cost Estimate due to the beam caps and wings being longer. For bridge width requirements, see EPG 231.8 Bridge Width. Interstate and Principal Arterial Routes 16’-6” over roadway including auxiliary lanes and shoulders Clear zone clearances from the edge of the traveled way (includes shoulders and auxiliary lanes) are obtained from the District Design Division. The vertical clearance is required for the full width of the clear zone. Barrier is required if unable to locate obstacles outside clear zone (columns, beams, walls, coping, 3:1 [1V:3H] slopes or steeper). If a barrier is required the minimum distance to the barrier shall be specified on the Bridge Memorandum as the horizontal clearance otherwise the clear zone clearance shall be used. 1 Roadway vertical clearances are based upon AASHTO minimums with an additional 6 inches to accommodate future resurfacing of the roadway. An additional 1 ft. is required for pedestrian overpass facilities over roadways. Vertical clearances shown are also applicable when the facility under the bridge is being carried by a bridge. 2 To provide continuity of travel for taller vehicles exceptions can be made both rural and urban for any routes connecting to the systems where taller vehicles are allowed but not to exceed 16.5 feet. 3 Clearance is measured from the top of rails (from top of high rail on superelevated track). The required 18-ft. opening centered on the track shall be increased on each side of centerline 1.5 inches per each degree of curvature for any track crossed. 4 Fourteen feet is a preferred minimum. The absolute minimum is 9 ft. from the centerline plus 1.5 inches per each degree of any track curvature. 5 The minimum clearance of 22 ft. to be provided on one side of the track(s) is for off-track maintenance. If it is not obvious on which side of the track(s) this clearance is provided, a decision should be obtained from railroad's local representative. Assistance from Multimodal Operations may be required in some situations. Roadways: Consult with the structural project manager or the structural liaison engineer and the district contact for minimum allowable vertical and horizontal clearance. Vertically this is usually 12 to 18 inches below the final minimum vertical clearance. Horizontally this is usually a minimum number of lanes or minimum size of opening required during the project while specifying the locality of the opening (e.g. centered on existing lanes, two 12-ft. lanes minimum in each direction, etc.). These clearances shall be specified on the Bridge Memorandum to be used in the note required on the final plans. For note see EPG 751.50 A3. All Structures. Railroads: If feasible, 15 ft. horizontally from centerline of track and 21.5 ft. vertically from tops of tracks (from top of high rail on superelevated track). If either of these clearances is not feasible then obtain acceptable clearances from the railroad projects manager. For the detail required on the final plans showing minimum clearances during construction over railroads, see EPG 751.5.2.1.2.7 Features Crossed. Refer to EPG 131.1.7 Deficient Vertical Clearances on Interstates for information about coordinating minimum vertical clearance for grade separation structures with the Defense Department. For vertical clearance on stream crossings, see EPG 748.3 Freeboard. Sometimes a Solid Slab, Voided Slab, Prestressed Box Girders, Prestressed Voided Slab Beams or NU Girder bridge will need to be used instead of a Prestressed I-Girder due to limited vertical clearance or freeboard. Other times a Plate Girder or Wide Flange may need to be used instead of a Prestressed I-Girder for the same reason. Higher strength concrete girders may allow you to span further with shallower girders. Higher strength concrete prestressed I-girders should also be considered as a means to save money by eliminating girder lines. Prestressed concrete double-tee girders should be avoided if possible due to the redecking concerns for future maintenance. On grade separations with high skews, you may want to consider using a 4 span bridge with integral end bents rather than a 2 span bridge with semi-deep abutments. This should be considered if the semi-deep slab length exceeds 30’. On Prestressed I-Girder bridges, it is usually more cost effective to shorten the end spans of a 3 span Prestressed I-Girder bridge rather than having all spans the same length. The optimum span ratio is 1.1 to 1.0. For example, a span layout of (67’ - 76’ - 67’) is structurally more efficient than (70’-70’-70’). Most districts prefer a box culvert to a bridge because of the lower maintenance costs; however, if a stream crossing is on the borderline between a box culvert and a bridge, each option should be explored and presented to the district. The presentation to the district should include the cost estimate for each option as well as a recommendation as to which option is preferred by the Bridge Division. Keep in mind that box culverts should be avoided on streams with medium to heavy drift. If the stream being crossed is a drainage ditch it is advisable to have the district to contact the drainage district to see if they have any specific objections (i.e. drift etc.) to using a culvert at the proposed location. Approval of proposed structure layout by the drainage district may be required, see EPG 747.3.4 Bridge Permits or Approvals by Other Agencies. A general rule of thumb for whether or not a culvert may be used in place of a bridge is... The most a culvert can handle is about 1,000 cfs per cell with 3 cells being the usual maximum. This can vary if the slope of the streambed is unusually flat or steep. Another rule of thumb is that the water from a drainage area of less than 5 square miles can usually be handled by a concrete box culvert. Curves or bends should be avoided when possible. See EPG 750.2.3.2.2 Head Loss Due to Bends when curves or bends will be used. For details of hydraulic design, see EPG 750.2 Culverts. Hydraulic designs and plans for some small box culverts are handled by the district. See EPG 750.7.4.3 Summary of Responsibilities for responsibility for analysis, design and final plans preparation. See EPG 750.7.3 Environmental Requirements for details of embedment, velocity and conveyance requirements. When sizing the proposed concrete box culvert, use Standard Box Culvert Sizes whenever possible. For information on standard box culverts sizes, see EPG 750.7.4.1 Standard Plans. For additional information on culvert size, see EPG 750.7.4.4 Size. The inside face of the headwall is located at the intersection of the roadway fill slope and the top of the top slab of culvert. Typically, the longest barrel is produced considering this intersection point upgrade. Flared inlets, varying roadway widths, clear zones and guardrail placement are possible exceptions to this rule. When clear zones are provided, locate the inside face of the headwalls of the culvert at or beyond the edge of the roadway clear zone. In situations of very low fill, contact the district to determine if the use of guardrail is preferred to placing the headwalls beyond the edge of the clear zone. When clear zones are not provided the district will determine the need for guardrail on a case by case basis. Typically when guardrail is to be used over a culvert the typical section will show a 3’ 5” shoulder widening as shown in Standard Plan 606.00. Consult the district if it is unclear whether adequate clear zones are provided or if guardrail is to be used over a box culvert. If the fill over the culvert is shallow, guardrail attachment may need to be provided. It may be advisable to lengthen culverts with shallow fill slightly to provide room for future guardrail attachments if guardrail over the box culvert is not provided. Minimum roadway fill height is determined at the outside shoulder line and is the greater of 1 ft. or the thickness of the pavement and base material specified in EPG 750.7.11.1 Minimum Fill Heights. Pavement and shoulder widths and thicknesses are determined on a project by project basis. Pavement and shoulder details (i.e., width, thickness, alternate pavement options) can be obtained from the district if needed, but based on maximum pavement thicknesses and minimum shoulder widths, fill heights at the outside of the shoulder of 20 ½” or greater on major routes or 14 ½” or greater on minor routes will not require pavement or shoulder details. For more information on pavement and shoulder widths and thicknesses see Other Aspects of Pavement Design and EPG 231 Typical Section Elements of Roadways. 1. Culvert ends with shallow fill and headwalls located outside of the clear zone. 2. Median of a divided highway with shallow fill. 5. Steep grade with a wide or skewed culvert. For additional information of roadway fill, see EPG 750.7.11 Overfill Heights. Check the Preliminary Geotechnical Report for recommendations concerning fill settlements and the use of collar beams on longer box culverts. Cambering of the culvert should also be considered when fill settlements are appreciable. For more information, see EPG 750.7.9 Camber in Culverts. If the use of precast box culvert sections will not be allowed to be substituted for cast-in-place construction or if precasting is required it should be noted on the bridge memorandum and on the bridge plans. Precast option for box culvert extensions will be permitted using a cast-in-place connection where the centerline of new cells is not laterally displaced more than 15° (maximum) from the centerline of existing cells for each cell extension. If a culvert requires design for abrasion it should be noted on the bridge memorandum. For more information see EPG 750.7.4.2 Abrasion of Interior Surfaces. Once you have determined that your structure will have girders, you must decide what types of girders to use. For checking your vertical clearance or freeboard, you will need to know the maximum span length of each type of girder. See EPG 751.22 P/S Concrete I Girders or EPG 751.14 Steel Superstructure. You will need to make adjustments if the span ratios get over 1.25. Notify the district contact as soon as you know that the profile grade will need to be raised or lowered to meet the minimum vertical clearance or freeboard requirements. If the district says the profile grade can’t be raised, consider using more girder lines, using higher strength concrete if Prestressed MoDOT Girders or NU Girders are being used, or switching to a prestressed voided slab or prestressed box beam bridge. As a last resort, request a design exception for the substandard item. If you decide to go with a Prestressed Bulb-Tee Girder, try to limit the maximum span to 125 feet. We have gone as far as 133 ft. but the strands had to be at 1 1/2 in. centers. Also keep in mind that these types of girders are very heavy and will often require two or three cranes to set them and may be difficult to transport to the site. If you decide to use Plate Girders or wide flange beams, then you have to decide if the girders or beams should be painted or not. If site-specific conditions allow, the use of unpainted weathering steel (ASTM A709 Grades 50W and HPS70W) should be considered and is MoDOT’s preferred system for routine steel I-girder type bridges due to its performance, economic and environmental benefits. Cost savings are realized because of the elimination of the initial paint system as well as the need for periodic renewal of the paint system over the life of the structure. The potential for cost savings over the service life of the structure is estimated to be in the neighborhood of 30%. Weathering steels provide significant environmental and worker safety benefits as well. Since they do not require initial and periodic repainting of the whole bridge, emissions of volatile organic compounds (VOC) are reduced. Also, they generally do not require coating removal or disposal of contaminated blast debris over the service life of the structure. By eliminating the need for periodic repainting, the closing of traffic lanes can be prevented as well as the associated hazards to painters, maintenance workers, and the travelling public. Partial coating of weathering steel is required near expansion joints. See EPG 751.14.5.8. Periodic recoating or overcoating will be required, however, on a much smaller scale than the whole bridge with the effect that lane closures and associated hazards are greatly reduced compared to painted steel. Although weathering steel is MoDOT’s preferred system for routine I-girder bridges with proper detailing, it should not be used for box girders, trusses or other structure types where details may tend to trap moisture or debris. There are also some situations where the use of weathering steel may not be advisable due to unique environmental circumstances of the site. Generally, these types of structures would receive high deposits of salt along with humidity, or long term wet conditions and individually each circumstance could be considered critical. The FHWA Technical Advisory T5140.22 October 1989 should be used as guidance when determining the acceptability of weathering steel. Due to the large amounts of deicing salts used on our highways which ultimately causes salt spray on bridge girders, the flowchart below should be used as guidance for grade separations. The flowchart, Fig. 751.1.2.8, below, is general guidance but is not all inclusive. There may be cases based on the circumstances of the bridge site where the use of weathering steel is acceptable even though the flowchart may indicate otherwise. 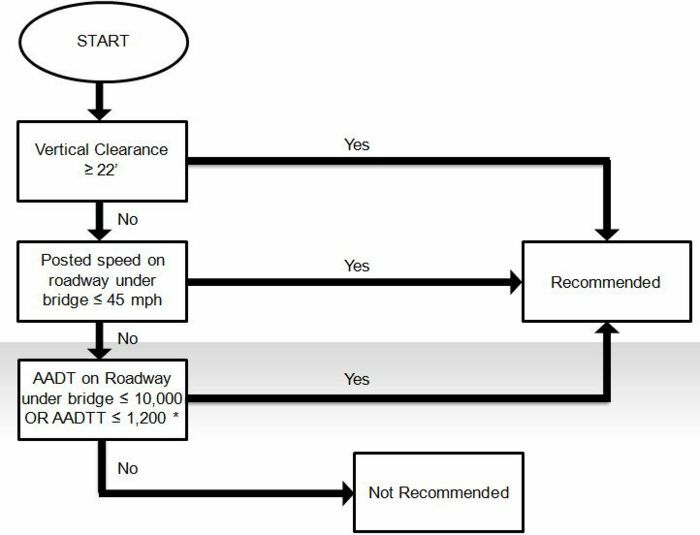 In these cases, follow MoDOT’s design exception process. Fig. 751.1.2.8 Guidance on the Use of Weathering Steel for Grade Separations * For multi-lane divided or undivided highways, consider the AADT and AADTT in one direction only. Weathering steel may be used for stream crossings where 1) the base flood elevation is lower than the bottom of girder elevation and 2) the difference between the normal water surface and bottom of girder elevations is greater than 10 ft. for stagnant and 8 ft. for moving bodies of water. Where the difference in elevations is less than noted, weathering steel may be used upon approval of the Assistant State Bridge Engineer. 1. Transporation Research Board. (1989). Guidelines for the use of Weathering Steel in Bridges, (NCHRP Report 314). Washington, DC: Albrecht, et al. 2. American Iron and Steel Institute. (1995). Performance of Weathering Steel in Highway Bridges, Third Phase Report. Nickerson, R.L. 3. American Institute of Steel Construction. (1993). Highway Structures Design Handbook (Vol. I, Chapter 9. Uncoated Weathering Steel Bridges). Pittsburgh, PA: Mathay, W.
4. MoDOT. (1996). Missouri Highway and Transportation Department Task Force Report on Weathering Steel for Bridges. Jefferson City, MO: Porter, P., et al. The final brown rust appearance could be an aesthetic concern. When deteriming the use of weathering steel, aesthetics and other concerns should be discussed by the Core Team members, with input from Bridge Division and Maintenance Division. If weathering steel cannot be used, the girders should be painted gray (Federal Standard #26373). If the district doesn’t want gray, they can choose brown (Federal Standard #30045). If the district or the local municipality wants a color other than gray or brown, they must meet the requirements of EPG 1045.5 Policy on Color of Structural Steel Paint. System H paint should be used on weathering steel while System G should be used on all other steel plate girders. For bridges that are longer than normal (more than 6 spans being a general rule of thumb), other items must be considered. If the feature you are crossing allows flexibility in bent placement, the most cost efficient span length is one that will result in the cost of one span's superstructure being equal to the cost of one bent. For example, calculate the cost of one intermediate bent, and then adjust the length of the span until the cost of the girders, slab and curb equal the cost of the bent. The use of higher strength concrete in Prestressed I-Girders can allow spans to be increased 16% to 21% as a means to eliminate intermediate bents. Another item to consider is the placement of expansion devices. Be sure to include the costs of the expansion devices and deadman anchors (if applicable) in your Preliminary Cost Estimate. If the new structure you are laying out replaces an existing structure, the exact details of the staging must be coordinated with the district contact. If the new structure is on a new alignment, there is little cause for concern. However, if the new structure is on the same or slightly different alignment, the location of the bents for the new structure should be spaced to avoid the existing substructure units if at all possible. Also, if the new structure is on the same or slightly different alignment, the question of traffic handling will need to be addressed. If the district wants to use a temporary bypass, then you need to determine if the district can size some drainage-diversion pipes for the bypass. If the district decides pipes cannot be used, then a temporary bridge is necessary. A separate Bridge Survey/Memo/Bridge No. is required. If the district does not want to use a temporary bypass, and they want to maintain traffic on the existing bridge while the new one is constructed, then the new structure will have to be staged. One important item to verify in this situation is that the new girders will clear the existing substructure. Another item to consider in setting up the staging is the placement and attachment requirements of the temporary concrete traffic barrier relative to the bridge deck and meeting horizontal distance requirements from the edge of the deck, which determines whether the temporary concrete traffic barrier is to be attached to the deck. It also determines how the temporary concrete traffic barrier is to be attached to the deck. Bridge Plans must note whether temporary concrete traffic barrier are attached or freestanding, and if attached, whether they are attached with tie-down straps or bolt through deck attachment. Coordination is required with district Design. See EPG 617.1 Temporary Traffic Barriers for more guidance. a. Where sufficient distance is available to accommodate lateral deflection of barriers: No attachment is required. Note on plans as “Freestanding” or “No attachment required”. b. Where sufficient distance is not available to accommodate lateral deflection of barriers: Tie-down strap system is required. (Refer to Standard Plan 617.20.) Coordinate with district Design to provide a minimum of four connected temporary concrete traffic barrier sections on approach slab roadway. c. Where lateral deflection cannot be tolerated: Bolt through deck system is required. (To be used only on existing decks that will be removed and that have sufficient strength.) (Refer to Standard Plan 617.20.) Coordinate with District Design Division for required transition barrier attachments that may be used on any deck, existing or new, where lateral deflection is not permitted with approval of the Structural Project Manager or Structural Liaison Engineer. For all other applications of a freestanding temporary concrete traffic barrier, the preferred installation method requires a 2 ft. buffer area behind the barrier to allow for lateral deflection in both work areas and lane separation situations. Regardless of deflection distance (buffer area) available, if the bridge deck is super elevated or has a large roadway slope, a freestanding temporary concrete traffic barrier should not be used because the barrier has the potential for movement (“walking”) due to gravity forces and vibrations acting on the barrier. When a temporary concrete traffic barrier is adequately attached to a bridge deck (refer to Standard Plan 617.20) a minimum distance of 6 in. shall be provided from the edge of the bridge deck to the face of the barrier. See EPG 756 Seismic Design for flowcharted seismic design requirements. All new bridge/wall designs must meet Seismic Design Category A requirements which includes nonseismic (or static) designs unless the seismic design category is B, C, or D. If the structure you are laying out falls in Seismic Design Category B, C or D, there are a few items to keep in mind. Box culverts are preferable to bridges on stream crossings because they are exempt from seismic design unless crossing a known exposed fault. Pile cap intermediate bents are preferable to open column bents on footings because footings can grow quite large due to seismic forces. Minimize the number of expansion joints in the deck because each of these locations may require earthquake restrainers which are very costly. Make the superstructure as light as possible, which usually means use steel plate girders or wide flanges instead of prestressed concrete girders where ever possible. For shorter spans, voided and solid slab bridges perform well. 1. For “Design Code Reference Document”, select “Derived from USGS hazard data available in 2002” followed by “2009 AASHTO”. 2. For “Site Soil Classification”, select “Site Soil Classification” (Select Site Class “A, B, C, D or E” for preliminary design per Geotechnical Section recommendation or for final design as given on Foundation Investigation Geotechnical Report. 3. For “Site Latitude” and “Site Longitude”, input coordinates or alternatively input address or zip code in the map area. The new bridge design schedule for a seismic bridge requires 24 months minimum. See EPG 751.1.1.5 New Regular Bridge Design Schedule. Deficient and SR < 50 Qualifies for full federal bridge replacement funds. Deficient and 50 < SR < 80 Qualifies for partial federal bridge replacement funds. Not Deficient Federal bridge replacement funds can not be used; however, other federal funds could possibly be used. If the sufficiency rating is greater than 50 but less than 80, then a cost analysis will need to be included in the layout folder showing that it is a better value or more cost effective to replace the bridge than it is to rehab/widen it. If rehab/widen is more cost effective, a state may elect to replace the bridge; however, federal bridge replacement funds may be capped at 80% of the rehab/widen cost estimate. See the following FHWA letter for a more detailed explanation. Include a copy of this form in the Layout Folder. An interstate job (job no. with an “I” in it) is an example of using federal funds to replace a bridge without worrying about the sufficiency rating of the existing bridge. The reason this is acceptable is because you are using federal “interstate” funds, not federal “bridge replacement” funds. An example of an SIA form can be seen below, followed by a letter from FHWA explaining guidelines for use of federal bridge replacement money. If the district will be using a bypass on stream crossings, a temporary bridge may be necessary. The district should first consider using large drainage-diversion pipes to carry the water under the bypass, if the district determines this is not practical, they should submit a Bridge Survey for a temporary bridge on the bypass. Check with the Structural Project Manager for hydraulic design frequency. Once the number of 40’ spans has been determined, the district should be contacted so they can locate the pieces necessary for the construction of the bridge. Make sure the pieces the district intends to use have the “new” beam caps that take 14” H-pile. The district should provide you with the location of where the pieces are coming from and where they should be taken by the contractor at the end of the project. If the district is unable to find the pieces, then they will need to be contractor furnished. This has a big impact on costs. See Preliminary Cost Estimate. Railroads often raise their tracks so provide some cushion in your vertical clearance. Will the railroad want room for an extra track or maintenance roadway? Keep the ballast free drained. Drainage needs to be designed for 100-year storm. Slope protection shall consist of Type 2, 18-inch thick rock blanket placed on top of permanent erosion control geotextile. Some railroads may require changes to this; however, this will be determined on a case-by-case basis. Some railroads also now require the barrier curbs and slab overhangs to be designed to accommodate fences that may be added in the future. If the face of the columns of an intermediate bent falls within 25 ft. of the centerline of the railroad track, a collision wall is required. If the face of the columns of an intermediate bent falls within 12 ft. of the centerline the top of the collision wall shall be set at 12 ft. above top of rail otherwise the top of the collision wall shall be set at 6 ft. above top of rail. The railroad projects manager in the Multimodal Operations Division is a very good resource for answering questions at any stage of the layout. It typically takes a very long time to receive approval of a layout from the railroad. The railroad has to approve both the preliminary design and the final plans. When making a submittal to the railroad project manager for approval of the preliminary design, include three sets of half-sized plat and profile sheets, as well as a copy of the Design Layout. 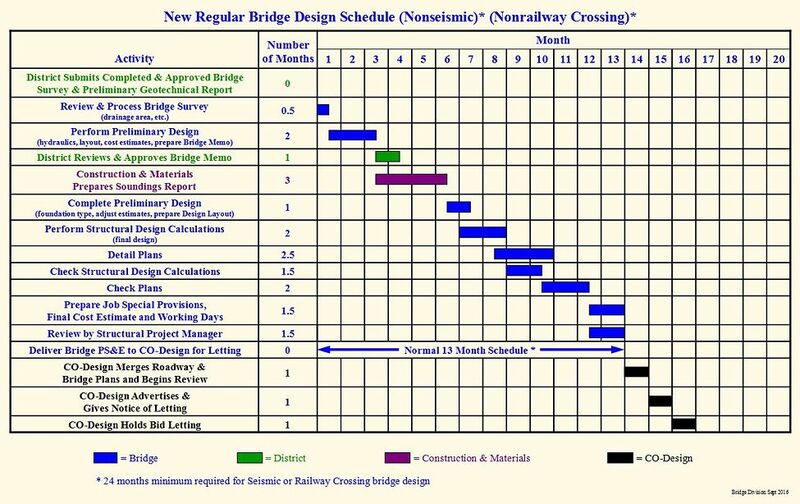 The new bridge design schedule for a railway crossing bridge requires 24 months minimum. See EPG 751.1.1.5 New Regular Bridge Design Schedule. "Bridge Resources are both public and privately owned highway, railroad and pedestrian bridges, viaducts and culverts. This does not include metal and plastic pipes, unless they are encased in an older concrete, stone or brick structure." "Bridge Resources on any given job or location study need to be checked out and cleared just like historic buildings (architecture) and archaeological sites. Standard size color photographs can be submitted to the Historic Bridge Coordinator directly and/or attached to the Request for Environmental Assessment (RES) or Questionnaire to Determine Need for Cultural Resources Assessment. The Historic Bridge Coordinator will then determine and execute procedures for clearance, if required." Bridges that are older than 50 years stand a better chance of being evaluated as eligible for the National Register of Historic Places (NRHP) in Clayton Fraser's 1996 draft Missouri Historic Bridge Inventory. This is a study that was undertaken under STURAA (Surface Transportation and Uniform Relocation Assistance Act of 1987) in order to inventory all potentially NRHP eligible historic bridges in the state. Any of these that are determined NRHP eligible by the HPP will require special mitigation (or avoidance) if they are to be affected by project activities. For this reason, it is important that all bridge resources be identified early in the process. Usually, bridge resources do not stand in the way of right of way acquisition (A-dates) because they are generally located on roadways that the state already owns; however, there are cases in which bridge resources are privately owned and located on private property. In these rare cases, bridge resources would need to be checked out prior to our right of way acquisition approval. The Preliminary Cost Estimate should be neat, legible and dated since a copy of it is included with the Bridge Memo. It should also be rounded to the nearest thousand dollars. The accepted method of calculating the Preliminary Cost Estimate is to actually calculate some approximate quantities for the bridge and then multiply them by the unit prices supplied by the Bridge Division Preliminary and Review Section. A spreadsheet should be used to calculate these quantities. To estimate the pounds of reinforcing steel in a structure, multiply the number of cubic yards of concrete in the structure by 125 for bridges. See table below for Box Culverts. The Preliminary Cost Estimate should be increased for the following items: Cost Estimate Guide for rural preliminary design (do not compound the increases by using your judgment). These factors assume estimated quantities have not been increased due to seismic forces. The average costs vary. Usually they fall within these ranges. Bridge Memorandums are generated for new and rehabilitated bridge structures including retaining walls. Formal correspondence will not be required for special structural work or miscellaneous structures like high mast tower lighting (HMTL) or small retaining walls equal to or shorter than 5 feet; however, documentation such as a Bridge Memorandum may be a good idea in order to effectively communicate the understanding and agreement to the level of design work proposed and associated construction costs with districts. The Bridge Memorandum is the instrument which coordinates bridge plan and roadway plan preparation. It is sent to the district to inform them where we plan to put the bridge, what kind of structure it will be, what the Preliminary Cost Estimate is and any other pertinent information. More information is required on more complicated structures. If you are not sure if the district needs to have a certain piece of information concerning the structure, include it on the Bridge Memorandum to be safe. Too much information is better than too little. An electronic copy of the bridge memorandum and supporting documents are sent to the district for review and signature. If, during the design process, revision to the bridge memorandum by either the district or the Bridge Division becomes necessary, all parties to the memorandum are to be notified immediately. The proposed revisions must be agreed to by all parties that signed the original bridge memorandum. The Bridge Memorandum also serves as a design layout for structures where the latter is not required, see EPG 751.1.2.32 Finishing Up Design Layout. 1. Identify type of structure, span lengths, skew, loading, roadway width, wing lengths and special end fill considerations. For curved structures, specify how the design span lengths are to be measured i.e., “measured along the CL of Roadway”. If plate girder or wide flange beam, further identify them as either weathering or painted steel. 2. 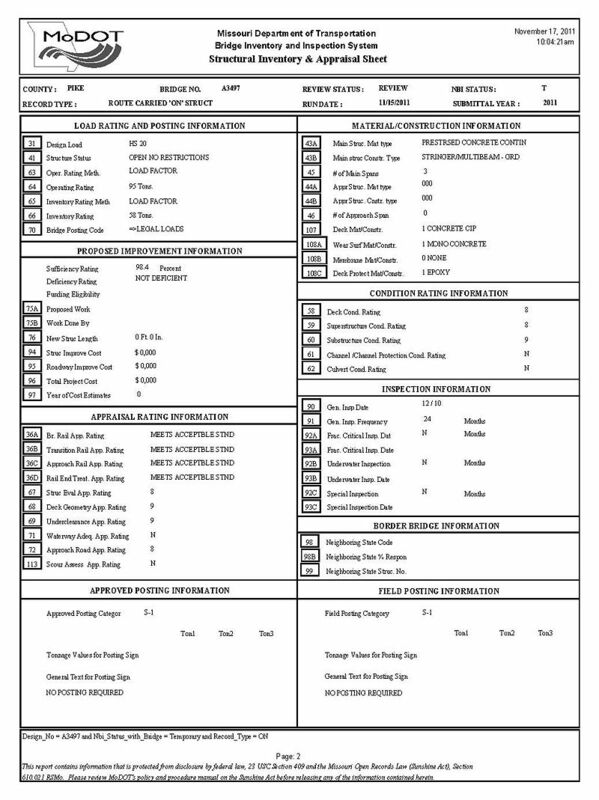 Indicate all pertinent profile grade, alignment and superelevation transition information. 3. Identify the fill exception stations or ends of the bridge. The district uses this to coordinate the bridge with their roadway design features such as guardrail. For PSI-Girder bridges, take into account the layout length when calculating these stations. 4. Identify slopes at end bents. 5. Indicate elevation of any berms to be constructed at the end bents. 6. If applicable, call for old roadway fill to be removed to natural ground line. 7. For box culverts, indicate the location of the headwalls and the type of wings to be provided (flared or straight). Also include the upper and lower flow line elevations along the CL of the box. 8. Identify any bridge related items that the district will need to address in their plans or special provisions as a “Roadway Item”. 9. Include the cost estimate for construction (Preliminary Cost Estimate). 10. Include the method of traffic handling while construction is underway. Attach sketches for staged construction when appropriate. 11. For stream crossings, show all pertinent hydrologic data used for the layout of the structure. See EPG 751.5.2.1.5.3 Hydraulic Data for Hydraulic Data tables. 12. For roadway and railroad grade separations, include all minimum vertical and horizontal clearances (final and construction) and include the opening (horizontal limits) of the minimum vertical clearance. The minimum horizontal clearance shall be specified from the edge of the traveled way(s). "No conduit, lighting, utility supports or sidewalks are to be included in the final plans for this bridge." If the district has already indicated that they want special items attached to the bridge, include the specifics on the Bridge Memorandum and modify the above note. 14. The design year AADT (annual average daily traffic) and AADTT (annual average daily truck traffic). Request this from the district if it is not shown on the plat sheet. On grade separations, get the AADT and AADTT for both roads. 16. Also for box culverts, state if guardrail (Roadway Item) is to be provided in lieu of meeting the clear zone requirements. If there will be guardrail over the box culvert and the fill height is less than indicated in EPG 750.7.4.5, Box Culverts, Guardrail Attachment, indicate that attachment of the guardrail to the top slab will be handled in the bridge plans, even though the guardrail itself is a roadway item. For additional information on when to use guardrail attachments, see EPG 751.1.2.8.3.2 Length, Box Culvert, Length. 17. For stream crossings (new structures, widened structures and rehabs where the waterway opening is reduced.) include a statement stating that a Floodplain Development Permit is required or that a Floodplain Development Permit is not required and that the Bridge Division will request such a permit if necessary. Also indicate the flood hazard zone (i.e., A, A1, B) and whether or not the bridge is in a Floodway. 18. On Rehabilitated and widened structures give the current and proposed load rating and load posting as well as the current condition ratings for the deck, superstructure, substructure and scour. 19. Identify the bridge approach slab class major or minor. If a design exception is required or approved, then note accordingly. Identify asphalt mix type (determined by district) when the asphalt bridge approach slab sub-class is an option. 20. Identify the bridge end drainage provisions as determined by District Design. For example, note when concrete aprons at each wing wall will be required (Rdwy. Item). Note when concrete approach pavement (Rdwy. Item) with or without drain basins (Rdwy. Item) will be required, or note when rock blanket will be required that extends up to full length of bridge approach slabs, or when drain flumes (Rdwy. Item) will be required. 22. For retaining walls, indicate any aesthetic treatments such as concrete staining and form liner requirements. Be specific regarding names, types and colors of staining, and names and types of form liner. 23. Form liners are standard for MSE large block walls. Be specific regarding names, types and colors of staining, and names and types of form liner. See Bridge Standard Drawings – MSE Wall - MSEW. 26. For rehabs, redecks, widenings, recoatings and new replacement structures, see EPG 751.1.3.9 Environmental Considerations: Asbestos, Lead and Recoating for notes to include. Once the Preliminary Designer has the Bridge Memo and supporting documents completed, they are submitted to the Structural Project Manager (SPM) for their review. The SPM will then request a Bridge Memo Conference with the Assistant State Bridge Engineer, the Structural Resource Manager and the Structural Prelim. & Review Engineer. After the review and conference, the Preliminary Designer will update the Bridge Memorandum and supporting documents.. The Designer and SPM sign and date the memo by typing their names and the date in the locations provided. 1)	Bridge Memorandums and supporting documentation will be made available on SharePoint by Bridge Division. 2)	The Bridge Division preliminary designer or Structural Project Manager (SPM) will email the Transportation Project Manager (TPM) and the District Bridge Engineer a link to the Bridge Memorandum in SharePoint when the memorandum is ready for review by the district. (A link to the Constructability Questionnaire, Cost Estimate, Layout for Soundings, and Request for Soil Properties may also be included.) As part of their review the TPM should forward the Bridge Memorandum to the appropriate Resident Engineer to solicit their input on the Memorandum. 4)	Once the district’s review of the Bridge Memorandum is complete the approving district personnel should type their names, titles and the date in the appropriate locations. 5)	The TPM or his designee emails the Bridge Division preliminary designer and SPM to inform them the district has reviewed and signed the Bridge Memorandum. A summary explaining any of the changes should be included in the email. 6)	The Bridge Division preliminary designer or SPM will accept the changes or coordinate with the TPM or his designee to resolve any differences. 7)	Once all differences are resolved the Bridge Division preliminary designer or the SPM will email the TPM or his designee indicating the agreement process is complete. Changes made to the Bridge Memorandum after the initial agreement may be handled by email or by the process described above. The Bridge Memorandum, supporting documents and related correspondence will be stored on the Bridge Division SharePoint page in the Projects -Inwork directory. A copy of the agreed upon bridge memo is placed in the Layout folder. If changes are made after the initial agreement, a copy of the revised memo should be added to the layout folder and the original bridge memo marked as void with the date of revision noted. The borings define subsurface conditions at the project site and are used to determine type of foundation (driven piles, pile cap footing, spread footings, drilled shafts), preliminary estimate of pile lengths and engineering design properties. Note that two types of soundings are typically provided by a soundings investigation. 1. Auger Borings - These are the most typical type of soundings provided due to availability of equipment and low cost. This type of boring is generally stopped immediately upon encountering "hard rock". All description of type of soil and rock encountered is determined in the field. 2. Core Samples - These are more time consuming and expensive. They are also subject to the availability of the specialized equipment and are therefore provided as sparingly as possible by the soundings crew. Once "hard rock" is encountered at a coring location, drilling is continued for an additional 10 ft. to ensure a consistent layer of actual hard rock (not a boulder). If a void layer is encountered in the additional drilling, the drilling is continued until another 10 ft. of consistent hard rock is encountered. In addition to field determination of soil layer type and performance of the Standard Penetration Test (SPT), samples are returned to the lab for additional tests such as determination of rock quality (% RQD). Bridges – Borings should be requested at each bent. For bents on columns, estimate the number and location of the columns for each bent and request borings for these locations. Box Culverts – Borings should only be requested for Box Culverts on Rock (no bottom slab). Borings should be requested every 10 ft. along the alignment of both exterior walls for single box culverts and along both the exterior and interior walls for multiple cell culverts. MSE Walls – Borings should be requested at 25 ft. intervals along the baseline of the MSE Wall and at control points along the wall (such as bend lines). For a MSE Wall that wraps around an end bent, consideration should be given as to whether requesting additional borings in a grid pattern between the walls is necessary. CIP Concrete Retaining Walls – Borings should be requested at 25 ft. intervals along the wall alignment. 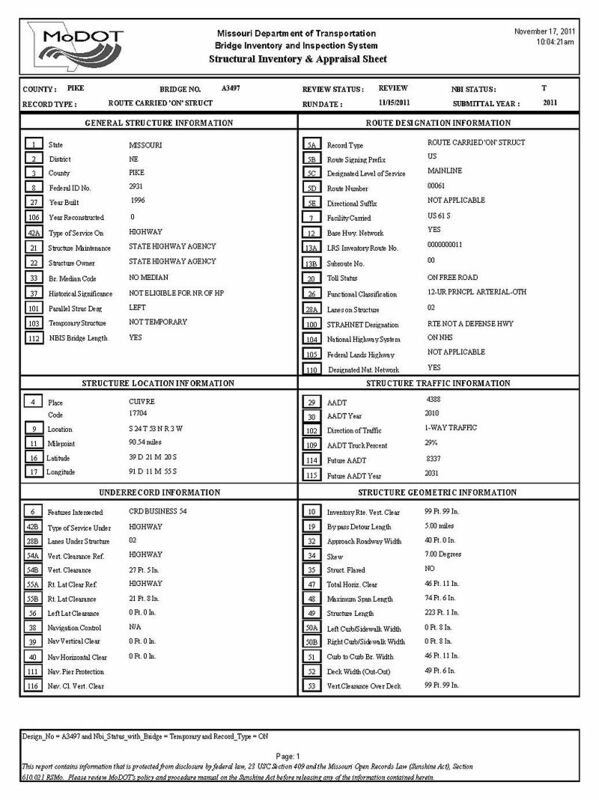 Plan and Elevation/Profile Sheets. Using MicroStation, the proposed structure should be drawn on the bridge survey plan sheet(s). Boring symbols should be placed at all requested boring locations. To find the Northing and Easting, the "Label Coordinates" tool in Microstation can be used. The grid factor, projection factor, coordinate system, zone, horizontal datum and vertical datum will be required information necessary for completing the Request for Final Soundings for Structures Form, all of which should have been provided with the bridge survey report. Plan and Elevation Sheet(s) of Existing Bridge. When applicable. Request for Final Soundings for Structures Form. The Guidance for Request for Final Soundings for Structures Form is available. Bridges – Provide cores at alternating locations with one core per bent. Where rock is not encountered at core sampling locations, make standard penetration tests at 5 ft. depth increments. If rock is encountered at these core locations, provide RQD determinations at 5 ft. depth increments. If a sounding location is not accessible, please provide an alternative sounding as close as possible to the requested location in order to get an accurate representation of soil conditions at the bent line. Box Culverts – Provide cores at each location to determine depth and quality of rock. Information will be used to determine structure type (concrete box on rock – without bottom slab) and excavation quantities. If rock is unsuitable for concrete box on rock, discontinue core and sound depth to rock. If sounding location is not accessible, provide an alternate sounding as close as possible to the requested location in order to get an accurate representation of soil conditions along proposed culvert wall. Retaining Walls - Request that soundings be taken every 25 ft. along the wall alignment. Soundings shall be made to rock or to a point which is 20 ft. below the bottom of the wall, whichever is higher. Request for Soil Properties – The request for soil properties is located on a separate tab in the Request for Final Soundings for Structures form. Bridges – If there is a possibility that drilled shafts will be used, request borings based on using drilled shafts so the appropriate lab work can be done the first time. MSE Walls – The request for soundings for MSE walls should include requests for the angle of internal frictions (Ø) for both the foundation and the retained material. 1 Preferred due date should be discussed at the memo conference and the Geotechnical Section contacted to establish a due date. The completed Request for Final Soundings of Structures form and the other supporting documents listed above should be stored on the Bridge Division SharePoint page in the Projects-Inwork directory under the structure’s subfolder. (Consultants should contact the Structural Liaison Engineer). A request for soundings should be sent by email to the Construction and Materials Division. The email shall be addressed to the Geotechnical Engineer and copied to the Geotechnical Director and the Structural Project Manager (or the Structural Liaison Engineer). It should include at a minimum, a link to the SharePoint folder that contains the completed Request for Final Soundings of Structures Form and supporting documents. In addition to the SharePoint link, any relevant information that may aid the Geotechnical Section in providing the requested borings should be included. The request for soundings is typically done at the same time that the Bridge Memorandum is sent to the district. Once the signed Bridge Memo and the Borings are received, the entire layout folder should be given to the Preliminary Detailer (requested by SPM, assigned by Structural Resource Manager). The Preliminary Detailer will copy the appropriate Microstation drawings into their own directory. (Do not rename files) Consultants contact Structural Liaison Engineer. The Preliminary Detailer will then draw the proposed bridge on the plat and profile sheets. The bridge should also be drawn on the contracted profile for a perspective of the profile grade relative to the ground line for drainage considerations. The Preliminary Detailer will also generate a draft Design Layout Sheet and then return the layout folder to the Preliminary Designer for review. For column bents, an economic analysis should be performed to compare drilled shafts to footings with cofferdams. When evaluating the drilled shaft option, keep in mind that if casing is used (see Geotechnical information) it should extend at least as high as the elevation that would be used for the seal course design. Also keep in mind that the permanent casing should be kept at least one foot below the ground line or low water elevation. Any casing above this elevation will be temporary. End Bents are usually pile cap bents; however, if quality rock is abundant at or just below the bottom of beam elevation, a stub end bent on spread footings may be used. If you have any doubt about the suitability and uniformity of the rock, you can still use a pile cap end bent. Just include prebore to get a minimum of 10 ft. of piling. If you have concerns about temperature movements, you can require that the prebore holes be oversized to allow for this movement. For any pile cap bents, where steel piles are to be placed near a fluctuating water line or near a ground line where aggressive soil conditions exist or anticipated to exist in the future, corrosion can result in substantial material loss in pile sections over time, either slowly or rapidly. Galvanized steel piling is required for all new pile cap bents to be used as a deterrent to both accelerated and incidental pile corrosion as commonly seen in the field. Further, conditions like known in corrosive soils, some stream crossings with known history of effects on steel piles and grounds subject to stray currents, these conditions should affect the decision of whether pile cap bents can be effectively utilized. The potential effects of corrosion and the potential deterioration from environmental conditions should always be considered in the determination and selection of the steel pile type and steel pile cross-section (size of HP pile or casing thickness), and in considering the long-term durability of the pile type in service. Once the substructure type has been determined, re-examine your Preliminary Cost Estimate and notify the district if it needs to be adjusted. Galvanizing shall be required for all steel piles. Utilizing galvanized steel piles and pile bracing members shall be in addition to the requirements of Standard Specifications Sec 702 except that protective coatings specified in Sec 702 will not be required for galvanized piles or galvanized bracing members. Where galvanized steel piling is expected to be exposed to severe corrosive conditions, consideration can be given to increased steel pile thickness or consideration of a reduced loaded steel area for bearing, or conditions mitigated to prevent long term corrosivity risk . This equally applies to the potential corrosion and early deterioration of permanent steel casing used for drilled shafts though they are not required to be galvanized. For all cases, further consideration beyond normal practice should be given to investigating corrosion protection, rate of corrosion as it relates to steel thickness design and expected service life including galvanizing losses, corrosion mitigation or different substructure support in order to meet a 75 year or longer design life. For additional information refer to LRFD 10.7.5 and 10.8.1.5. Consult with the Structural Project Manager or Structural Liaison Engineer to determine options and strategy for implementation. All surfaces of piles shall be galvanized to a minimum galvanized penetration (elevation) or its full length based on the following guidance. The minimum galvanized penetration (elevation) shall be estimated in preliminary design and finalized in final design. The minimum galvanized penetration (elevation) or full length will be shown on the design layout. The designer shall establish the limits of galvanized structural steel pile (i.e., HP pile and CIP pile). All exposed pile plus any required length below ground shall be galvanized. Based on required galvanized pile length determine and show Minimum Galvanized Penetration (Elevation) or Full Length on the Design Layout and on the plans. For retaining walls supported on piles, the minimum galvanized penetration (elevation) for piles shall be 15 ft. below bottom of wall or use engineering judgment. For bridge end bents on piles with embankments supported by MSE walls, the minimum galvanized penetration (elevation) for piles shall be 15 ft. below top of leveling pad or use engineering judgment. Protective coatings are not required in accordance with Sec 718. Galvanized pile is not required. All HP piles driven to rock shall require pile point reinforcement. Once it has been determined that a bent will have columns on footings, the next decision is whether the footings should be pile or spread (on shale or rock). If it is a stream crossing, the bottom of footing elevation should be based on the scour calculations found in EPG 750.3 Bridges, an article dealing with hydraulic design. The borings should then be studied to see if a minimum of 10 ft. of piling can be placed below the footings. If this is doubtful because of the presence of shale or rock, spread footings or drilled shafts should be used. In instances where it appears that a spread footing can be used but there are pinnacles in the area, you may want to use a pile footing and just require prebore to ensure that you get the minimum embedment of 10 feet. For spread footings on grade separations, include a “not above” elevation to ensure a footing cover of at least 3 feet. The two types of piling commonly used are HP pile and close-ended pipe pile (cast-in-place, CIP). Open ended pipe pile (cast-in-place, CIP) can also be used. HP piles are commonly used as end bearing piles when shale or rock will be encountered at an elevation that will limit the pile lengths to about 100 ft. or less. CIP piles are commonly used as friction pile for which a minimum tip elevation must be determined (see EPG 751.36.2 Steel Pile for criteria). All HP piles driven to rock shall require pile point reinforcement. For CIP piles, use pile point reinforcement if boulders or cobbles or dense gravel are anticipated. For all piles, prebore if necessary to achieve minimum embedment. * 15’ if the material is hard cohesive or dense granular; 20’ if the material is soft cohesive or loose granular. All designers doing preliminary design should use the DRIVEN computer program to estimate the lengths for piling. One way to check the validity of your DRIVEN results is to look at the piling information for existing bridges in the vicinity. Please also be on the lookout for any borings that contain "glacial till" (gravelly clay). This material is notorious for stopping pile. This procedure is not a substitute for experience and engineering judgment. It is simply an attempt to have a more uniform method for estimating pile lengths. All soil data must be obtained as well as elevation information pertaining to intermediate and end bents. The soil borings and core information are then observed. The unit weights of the different soil layers are determined by correlating information from the core data with information found in reference tables. The resulting unit weights are written on the soil boring page. If the soil is cohesive, the undrained shear strength should be determined by dividing the results of the pocket penetrometer test by two. If there was no pocket penetrometer test performed, then a correlation between the SPT blow counts and the undrained shear strength can be determined from reference tables. The water table must be identified or estimated and labeled on each of the borings and cores. The water table is usually distinguishable by the presence of gray colored soil. Note that more accurate data is obtained from cores than is obtained from borings because borings are performed using an auger type apparatus that mixes and remolds the soil. Drilled shafts are to be used when their cost is comparable to that of large cofferdams and footings. Other examples include when there are subsurface items to avoid (culverts, utilities, etc.) or when there are extremely high soil pressures due to slope failures. The Foundation Investigation request should include a request for opinion regarding the necessity of permanent casing when drilled shafts are investigated. Cost estimate savings and supporting subsurface information shall be discussed with Construction and Materials before permanent casing is omitted on a project. The Foundation Investigation Geotechnical Report (or soundings report) for drilled shafts should supply you with the nominal end bearing (tip resistance) and side friction (side resistance) as well as the elevations for which the nominal rock values are applicable. An Excavation Datum should be placed on the Layout Sheet when water is expected to be encountered during the excavation for footings. The elevation used is usually the Low Water Elevation plus 1 foot (rounded up to the next even foot) but may be made slightly higher on bigger streams and rivers. Everything above this datum is Class 1 Excavation while everything below it is Class 2 Excavation. On structures over water with pile footings, a determination should be made as to whether or not to include seal courses. Seal courses are used in conjunction with cofferdams when a contractor may have trouble dewatering the footing excavation. They are usually necessary when you have sandy or gravelly soils and footing elevations below the stream bed. You will need to include a water surface elevation on the Design Layout Sheet for which the Seal Courses should be designed for. Typically the elevation used is the average of the Low Water Elevation and the Design High Water Elevation; however, a site visit may be required to determine how reasonable this is. In no case should this elevation be higher than the 10 year high water elevation or the overbank elevation. Cofferdams should be included if the depth of the hole for the footing exceeds 8 feet and/or the bottom of footing elevation is below the Ordinary High Water (OHW) elevation. Any bent that requires a seal course will also require a cofferdam. These are bid lump sum per bent. Consult with the Assistant State Bridge Engineer about this. All piling in pile footings should be straight (not battered) when a cofferdam is expected. On structures over water where medium to heavy drift has been indicated on the Bridge Survey, consider using web walls between the columns on the column bents near or in the stream. The bottom elevation for the web is typically 1' higher than the overbank elevation. The district shall be consulted for type of slope protection. Either Concrete Slope Protection or Rock Blanket can be used for grade separations and are Roadway Pay Items. On stream crossings, Rock Blanket is usually placed. The type and thickness of Rock Blanket is to be determined by the district based on the flow velocity from the Scour design flood frequency. This flow velocity is determined by the person doing the hydraulic calculations and should be placed on the Bridge Memorandum. Permanent erosion control geotextile is always required to be placed under rock blanket. Take the higher of these two elevations and compare it to the Low Girder Elevation minus 1.2 feet. Use the lowest of these two elevations for the upper limit of your Rock Blanket. This elevation should be placed on the profile sheets. If the toe of the abutment slope falls on the overbank, the rock blanket apron should extend from the toe toward the channel a distance equal to twice the 100 year flow depth on the overbank, but need not exceed 25 feet. Note: District Design has the option of extending rock blanket up to and for the full length of the bridge approach slab or otherwise using drain flumes for bridge end drainage. See EPG 503 Bridge Approach Slabs, EPG 611 Embankment Protection and Standard Plan 609.40. Anytime MoDOT standards are not followed, a Design Exception is necessary. These are usually initiated by the Transportation Project Manager in the district; however, if the item is related to the bridge, the Bridge Division will initiate the Design Exception. The Design Exception Information Form should be filled out by the preliminary designer and then reviewed by the Structural Project Manager (SPM). A complete explanation of the basis for the design variance must be provided, including cost justification and details on how the variance will affect adjacent properties. The SPM should then submit the Design Exception to the Assistant State Bridge Engineer for review. After this review, the Design Exception should be submitted to the State Bridge Engineer for his signature. This submission should include written comments from the SPM on why the Design Exception should be approved. Once the Design Exception has been signed by the State Bridge Engineer, the SPM should mail the Design Exception Information Form and cover letter to the Transportation Project Manager in the district. The TPM will sign it and then send it to the General Headquarters Design Division for final approval. The Design Division will supply copies of the signed Design Exception to both the district and the Bridge Division. These include not meeting the standards for freeboard, design frequency, etc. If the vertical clearance under a new or widened bridge does not meet the standard, a Design Exception is required. If the reduction in vertical clearance is due solely to the overlay of the road under the bridge, the Bridge Division would not initiate the Design Exception. On new structures, if the roadway and/or shoulder widths on the bridge match the approach roadway, the Design Exception would be initiated by the district. If the roadway and/or shoulder widths on a new bridge are less than the approach roadway, the Design Exception would be initiated by the Bridge Division. On Interstate Rehab (4R) jobs, an exception for width is required any time we don’t meet the new design standards. If an existing bridge is over 200 feet long, FHWA has said that they will routinely approve the width if both shoulders are at least 3.5’ wide, but we should still request the Design Exception. FHWA will want to see any approved Design Exceptions before they approve the preliminary design. On new bridges, the interchangeability of bridge approach slab classes will require a design exception. For example, if a Bridge Approach Slab (Major Road) is to be substituted for a Bridge Approach Slab (Minor Road), a design exception will be required and initiated by the Bridge Division based on project core team consensus. Design Layouts shall be generated for new bridges, retaining walls and when foundation work is required for bridge widenings. Otherwise, Design Layouts are not utilized for conveyance of information related to rehabilitation projects, or work on existing bridges or, more generally, on structures. Once the Preliminary Detailer has created the Design Layout Sheet and added the borings and details of the proposed bridge to the plat and profile sheets, they should be checked by the Preliminary Designer. These sheets are the end product of the Preliminary Design process and will be used to perform the structural calculations for the Final Design phase of the bridge, which results in the production of the contract plans. Here is a list of items to include. b. Traffic counts for the design year (AADT and AADTT). c. Tie station (if applicable). f. Profile grade information (including offset from CL of roadway or median). a. Type and span lengths. b. Roadway widths and type of barrier curbs. a. Skew(s) of all bents. b. Types of all bents. c. Type and locations of sway bracing for concrete pile cap intermediate bent with HP pile. d. Locations and top of wall elevations for collision walls. e. Embedment of encasement for encased pile cap bent. f. Location of tie beam. g. Bottom elevations of web beam. a. Type of end fill and maximum slope. Include earth plugs for piling in rock fill. c. Type and extent of spill and side slope protection (permanent erosion control geotextile fabric is required). e. Angle of internal friction to be used for deadman anchors. a. Type and lengths of all piling. c. Minimum tip elevations for all piles. d. Location and elevation for any preboring. e. Location of any pile point reinforcement (shoes). f. Types of footings, their elevations and allowable bearing (if applicable). g. Location of any cofferdams and/or seal courses. h. End bearing and side bearing capacity for any drilled shafts. i. Top of Rock Socket elevations and their minimum lengths. b. Include a sketch of any staging. a. Bridge No(s). of structures slated for removal. b. Estimate cost of removal and indicate that this cost is included in the total. a. Drainage area and terrain description. d. Design high water elevation. f. Overtopping frequency and discharge if less than 500 yr.
a. Locations of Bridge Approach Slabs. b. Call out slab drain requirements if other than the standard procedure. c. The location of the stationing reference line (CL roadway, CL median, other). e. Minimum final and construction clearances (vertical and horizontal). f. Use of weathering steel or color of paint (steel girders). g. Name and phone number of District Contact. i. Details of any utilities to be attached to the bridge. j. Details of any conduit, light supports or any other unusual attachments. l. Temporary shoring requirements and whether it is a Bridge or Roadway Item. m. Location of Maint. facility contractor is to use for delivery of MoDOT retained items. n. Directory/path for any Ceal, Geopak or Microstation files used for layout of bridge. o. Identify asphalt mix type (determined by district) when the asphalt bridge approach slab sub-class is an option. given on the Design Layout. Show the controlling return period (e.g. 100, 200, 500) in Foundation Data. If return periods are different for different bents, add a new line in Foundation Data. On the plans report note EPG 751.50 E2.22 for CIP pile. 3 Show for open ended CIP piles. Once the Preliminary Detailer and Designer are in agreement on these items, the entire layout folder should be submitted to the SPM for their review. The SPM will then request a Design Layout Conference with the Assistant State Bridge Engineer and the Structural Resource Manager. Following this conference, the Preliminary Detailer and Designer will make any requested changes and complete the assembly of the Layout Folder by including the approved Design Layout Sheet and one set of half sized plat and profile sheets. The Layout Folder should then be delivered to the SPM along with one set of half-sized plat and profile sheets and a copy of the Design Layout Sheet. The SPM should then use a cover letter to send the one set of half-sized plat and profile sheets, as well as the copy of the Design Layout Sheet, to the Transportation Project Manager in the district. Include in this cover letter any changes in the Preliminary Cost Estimate and the current Plans Completion Date. An example can be found on the next page. Supply a copy of the Design Layout Sheet to Development and Review. (Consultants contact Structural Liaison Engineer). The SPM should then enter the following information into Bloodhound. All other fields in Bloodhound should be updated at this time by the SPM. The SPM will then send a request for a Final Designer to the Structural Resource Manager. Federal involvement is determined in accordance with EPG 123.1.1 FHWA Oversight – National Highway System. Projects which are delegated for federal involvement for preliminary design on the PODI matrix must be submitted to FHWA for approval. That is the end of the Preliminary Design phase of bridge design at MoDOT. Aesthetic enhancements can include everything from form liners and different colored paints to actual brick or stonework on the bridge. The district is required to inform the Bridge Division if aesthetic enhancements will be required on a bridge. Aesthetic enhancements should be discussed by the core team during the scoping process. Note: Galvanized slab drains are to remain unpainted unless otherwise requested by the district. The required special provision is available if the district wishes to paint the galvanized slab drains. Form liners are typically supplied in 4 ft. wide sections. Consideration should be given to specifying concrete work in 2 ft. increments to avoid waste of form liner. Use of 1 ft. increments may be possible. Avoid specifying work requiring less than 1 ft. increments of form liner without approval of the Structural Project Manager or Structural Liaison Engineer. Specifying work requiring form liner using other than 4 ft. increments may affect cost and should be reviewed. Consideration should be given to the blast loading provisions given in AASHTO LRFD Bridge Design Specifications and AASHTO Bridge Security Guidelines for major bridges only and with the approval of the State Bridge Engineer. Requirements for provision of blast loading protection and for structural design should be documented on the Bridge Memorandum and Design Layout. See EPG 503 Bridge Approach Slabs. Modifying existing bridges is quite different from laying out new bridges. Bridge overlays, rehabs, redecks and only widenings when the substructure is not being widened require the preparation and approval of a Bridge Memo as the only official written document requiring signatory approval (see EPG 751.1.2.19 Bridge Memorandums) as a matter of procedure. A Design Layout is not required in these instances. However, bridge widenings when substructure and foundation work are required will require procedurally both a Bridge Memo and a Design Layout for signatory approval since soundings for exploring subsurface conditions will be required for the foundations. Overlaying an existing bridge as part of a roadway overlay project. Rehabilitating and/or redecking an existing bridge as a stand alone programmed project. Widening an existing bridge to meet minimum shoulder width requirements as part of a roadway overlay project. Widening an existing bridge to add lanes as part of a roadway project. Bridge Memorandums shall be required for documenting proposed construction work and estimated construction costs for district concurrence. Design Layouts shall be required only for widening projects where there is proposed foundation construction. This is probably the most common type of project. The first step is to determine the limits of the project. This can be done by looking at the description and log miles of the project in the Program Book. The district contact should also be consulted to make sure the project limits have not changed. The second step is using the Bridge Maps produced by the Maintenance Division to locate any and all bridges within the limits of the project. Once the Bridge Nos. for these structures are known, obtain a copy of the Bridge Maintenance report for each structure. These reports contain the log mile for each structure. Compare this to the log mile limits of the project. If the log mile on the report indicates the bridge is outside of the project limits, check with the district contact again to see if the bridge is to be included in the project. If a bridge falls within the project limits, it must be evaluated to see if it meets the current safety criteria for such items as shoulder width and curb type/height. If the job will be built with federal funds, any substandard safety item must be remedied or handled with a design exception. If the job will be built with 100% state funds, the bridge can be left alone (no safety improvements). In accordance with AASHTO LRFD, the term “railings” may be generically used to refer to all types of bridge traffic barrier systems used on bridges. Several types of bridge railings are acceptable for use on bridges in Missouri (see the Common Bridge Rails table); Thrie Beam Post-and-Beam Railings, Safety Barrier Curbs, Median Barrier Curbs, Type C & D Barrier Curbs, Curb and Parapet Railings, or any other FHWA approved crash tested barriers and curbs meeting TL-4 rating as given on the FWA Bridge Railings website. When using a concrete barrier, a five-hole bolt pattern shall be used for connecting the approach railing to the bridge railing. Bridge rails on single lane bridges may be used in place if for no other reason than the grade is not being raised. Shallow overlays measuring no more than 3/8” will not be considered as raising the grade. 1. If the deck is less than 8.5 in. thick, the attachment must bolt through the deck with a plate on the bottom side of the deck. In the past, MoDOT used details where a bent stud was formed within the deck. This is no longer acceptable because of observed failure in thin decks where the edge can break off and the bottom of slab can pop out during a collision. 2. The center of the rail shall be 21 in. (min.) to the top of the finished driving surface. 3. Thrie beams are not a preferred railing for interstate or high AADTs. Concrete barriers are preferred. 1. If installed at the same time as the driving surface, the top of the curb shall not be less than 2’-8” above the driving surface. 2. 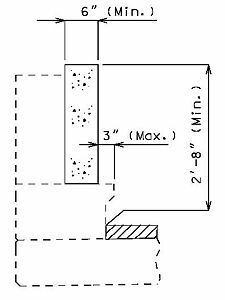 If a wearing surface is installed after the SBC or MBC is in place, the wearing surface thickness shall not be made greater than that whereby the curb height is made less than 2’-6”, i.e. the final grade with wearing surface installed shall not increase more than 2 inches. 3. If an existing wearing surface is replaced, the new wearing surface thickness shall not be made less than that where by the height above the driving surface of the break between the upper and lower slope of the barrier is made greater than 13 inches. 1. The concrete portions of the curb and parapet are the only components used in determining the height of the railing system for establishing if the system meets current standards or is substandard. The handrails are not crashworthy and therefore are not considered as part of the height of the system. 2. Curb and parapet railing systems were typically constructed 2’-3” high from the driving surface to top of parapet. 3. Sections of curb and parapet railing systems may be replaced without consideration of upgrading. 4. When a wearing surface is to be applied, the height of the existing curb and parapet system shall be determined from the existing driving surface and if necessary shall be heightened to 2’-8” above the proposed driving surface based on Guidelines for Curb Blockout, immediately below. Increasing the height of an existing curb and parapet railing system is generally done by adding a blockout to the curb and parapet (i.e., curb blockout). Guidelines were developed considering Practical Design concepts (refer to EPG 143 Practical Design). Guidelines apply to bridges to be resurfaced and/or rehabilitated that have concrete curb and parapet railing systems. They do not apply to bridges on Contract Leveling Course projects that are in accordance with EPG 402.1 Design of Leveling Course Projects. When resurfacing and rehabilitating a bridge, consideration shall be given to upgrading the curb and parapet railing system by increasing the overall height if the railing system does not meet criteria given in these guidelines. The guidelines are based upon reviewing conditions that require satisfying height and horizontal parapet offset requirements using the minimum height of 2’-3” in accordance with 2002 AASHTO 17th Edition and earlier editions and a maximum horizontal parapet offset of 6” from barrier curb face to parapet face which is a MoDOT requirement (EPG 128 Conceptual Studies, 3R-Rural Design Criteria recommends a 6” brush curb). Upgrades to curb and parapet systems should be made by constructing a curb blockout. The following guidelines describe circumstances where it is, or is not, necessary to upgrade curb and parapet railing systems that were either originally built substandard or made substandard due to an earlier overlay or will be made substandard due to a proposed overlay. Look at the 5-year history of accidents on the bridge (beginning log mile to ending log mile). If there were any accidents in this time period that involved a vehicle striking the curb, then curb and parapet not meeting current standards should be upgraded to meet the current AASHTO requirement which is to increase the height to 2'-8". If there were NOT any accidents in the 5-year history AND if the grade is not being raised then it shall not be necessary to upgrade the curb and parapet. If the accident history or grade criteria are not met, then it shall be necessary to upgrade the curb and parapet. The district may submit a design exception on non-NHS routes with AADT < 1700 to eliminate a curb blockout when there is no history of accidents on the bridge and the grade is being raised no more than 2” from the 2’-3” minimum height requirement. The overlay thickness can be limited to that which would not cause the curb and parapet railing height to become substandard. An exception to this is a 1/4" – 3/8” height tolerance to allow for the possibility of placing an epoxy polymer concrete overlay (EPO) on a bridge with an existing standard 2'-3" high curb and parapet as measured from the original driving surface to the top of the parapet. Adding an EPO will not by itself make a satisfactory curb and parapet railing height substandard as reviewed and approved by MoDOT and FHWA. Note: In all cases, the allowable overlay thickness would also be dependent on a structural review to confirm that the weight of the overlay would not lead to overstresses or an unacceptable posting. The horizontal offset (or ledge) from the curb face to the parapet face is recommended to be between 0” to 3” but shall not exceed 6”. If a curb blockout is used, the ledge shall not exceed 3”. End posts are not always the same width as the parapets. If the end posts are wider and if they extend towards the driving lanes, it shall be necessary to remove the end posts completely in order to construct the curb blockouts. If end posts extend towards the outside of the bridge, it may not be necessary to remove the end posts. Curb and Parapet (i.e. Brush Curb < 6”) YES 3/8” Epoxy Polymer Curb blockout for > 3/8” wearing surface Not used on new construction, redecks, or curb or cantilever replacements. Curb and Parapet (i.e. Brush Curb > 6”) NO	 None w/o retrofit Curb blockout preferred. Thrie beam alternate. Horizontal step must be 6” or less if to be UIP. Brush Curb w/ Steel Rail NO None w/o retrofit Curb blockout preferred. Thrie beam alternate. A variety of steel railing systems were employed on brush curbs. None are acceptable w/o retrofit. *Thrie Beam Bridge Rail (Embedded or bolted thru) YES – W6x15 blockout is not required if to be UIP 21” (Min.) from CL rail to top of wearing surface	 None required if min. height to CL rail is acceptable. Specified for new construction. The W6x15 blockout is included for all new construction. Thrie Beam Bridge Rail is not typically used on interstates or highways with high AADT. * Safety Barrier Curb or Single Slope 32” high or greater YES Up to 2” - Specified for new construction. *Steel Two Tube Rail YES Up to 2” - Specified for new construction. Not typically used on interstates or highways with high AADT. * Thrie Beam Bridge Rail, Safety Barrier Curb or Steel Two Tube bridge rails are typically specified for new construction, redecks, and curb or cantilever replacements. Aluminum handrail is not crashworthy and does not contribute to curb height. Use only the concrete portion. Many other, less common, railing systems have been constructed. Most are not crashworthy for rural highway speeds. Generally, the replacement of the existing rail is the only means to upgrade. For additional information on curb blockouts, see Guidelines for Curb Blockouts. A curb blockout is utilized along full length of curb. Bridge Division provides plans for curb blockouts. Grade B1 seal coat aggregate shall be used whenever a bridge deck is to receive an asphalt wearing surface. Grade A1 seal coat aggregate shall be used whenever the seal coat is to be the final riding surface. Grade C seal coats are no longer used for bridge applications because of dust issues. Follow guidance for new bridges and see EPG 503 Bridge Approach Slabs. Include the note shown immediately below if the asbestos and lead inspection report indicates that lead is present and the structure will be recoated. Contact the Wetland Coordinator in the Environmental Section to determine if paint removal will need to be included in the JSPs and include this information in the layout folder. Paint Removal will typically only need to be included on large paint projects, but the Environmental Section will need to be contacted to make this decision on all recoating projects including full repaints, partial repaints, expansion joints only and bearings only. 1Available only to MoDOT employees. All others: contact the Bridge Division or the Structural Liaison Engineer directly for information related to EPG 751.1.3.9 Environmental Considerations: Asbestos, Lead and Recoating. This article is intended to help with the issues unique to retaining walls. Many portions of EPG 751.1.2 Bridges/Boxes will still need to be used when working on retaining walls. When barrier curb must be attached to the top of the wall. When the underlying soil cannot support the weight of the fill and wall (must use CIP on piling). When you don’t have adequate room behind the wall for the reinforcing straps. In general a minimum reinforcement length of 8.0 ft., regardless of wall height, has been recommended based on historical practice, primarily due to size limitations of conventional spreading and compaction equipment. Shorter minimum reinforcement lengths, on the order of 6.0 ft., but no less than 70 percent of the wall height, can be considered if smaller compaction equipment is used, facing panel alignment can be maintained, and minimum requirements for wall external stability are met. The requirement for uniform reinforcement length equal to 70 percent of the structure height has no theoretical justification, but has been the basis of many successful designs to-date. Parametric studies considering minimum acceptable soil strengths have shown that structure dimensions satisfying all of the requirements of Article 11.10.5 require length to height ratios varying from 0.8H for low structures, i.e. 10.0 ft., to 0.63 H for high structures, i.e. 40.0 ft. Significant shortening of the reinforcement elements below the minimum recommended ratio of 0.7H may only be considered when accurate, site specific determinations of the strength of the unreinforced fill and the foundation soil have been made. Christopher et al. (1990) presents results which strongly suggest that shorter reinforcing length to height ratios, i.e. 0.5 H to 0.6 H, substantially increase horizontal deformations. The reinforcement length shall be uniform throughout the entire height of the wall, unless substantiating evidence is presented to indicate that variation in length is satisfactory. Lengthening of uppermost reinforcement layers to beyond 0.7H to meet pullout requirements or to address seismic or impact loads. Lengthening of the lowermost reinforcement layers beyond 0.7H to meet overall (global) stability requirements based on the results of a detailed global stability analysis. Shortening of bottom reinforcement layers to less than 0.7H to minimize excavation requirements, provided the wall is bearing on rock or very competent foundation soil. For walls on rock or very competent foundation soil, e.i., SPT > 50, the Bottom reinforcements may be shortened to a minimum of 0.4H with the Upper reinforcements lengthened to compensate for external stability issues in lieu of removing rock or competent soil for construction. Design Guidelines for this case are provided in FHWA Publications No. FHWA-NHI-00-043 (Elias et al. 2001). For conditions of marginal stability, consideration must be given to ground improvement techniques to improve foundation stability, or to lengthening of reinforcement. Small block walls are battered walls with a maximum height of 10 feet. Large block walls are vertical walls with heights that may exceed 10 feet. Combination wall systems are considered small block wall system and shall be battered with a maximum height of 10 feet. Aesthetic enhancements may be used for either CIP or MSE walls. If aesthetic enhancements are required by the district, form liners and concrete stains are encouraged rather than actual brickwork and stonework since form liners and concrete stains typically need less maintenance, less loading, less detailing, no extra support ledge and produce no risk of delaminations or falling work. However, for MSE large block walls only, form liners are required for all panels. For additional information, see EPG 751.24.2 Mechanically Stabilized Earth (MSE) Walls. Any deviation from the criteria listed shall be discussed with Structural Project Manager. Generally, both the horizontal alignment and the top of wall elevations are supplied by the district in the Bridge Survey. You do need to check the top of wall elevations to make sure the district accounted for any concrete gutters placed behind the top of the wall (Gutters are necessary if the slope of the fill can direct water towards the top of the wall, i.e. positive sloping and flat backfills). The district should decide whether to use Type A or Type B gutters (Standard Plan 609.00), or Modified Type A or Modified Type B gutters (Standard Plan 607.11) if fencing is required, and where they should drain (to be shown on roadway plans). For general guidelines, see EPG 751.24.2 Mechanically Stabilized Earth (MSE) Walls. The absolute minimum embedment is 2 ft. When the soundings are returned, they will include a minimum embedment necessary for global stability. Preliminary cost estimating MSE walls is based on the unit price bid history and on the square footage of the area of the face of the wall. The unit price per square foot of wall includes wall elements, leveling pad and backfill. Excavation and retained fill are not included. If soundings indicate weak material exist, then the designer should investigate that sufficient right of way limits exist to address the required length for the soil reinforcement. For additional information, see EPG 751.24.2 Mechanically Stabilized Earth (MSE) Walls. Once you determine that you must use a CIP concrete wall, there is very little to do as far as the layout of the structure. Both the horizontal alignment and the top of wall elevations are supplied by the district in the Bridge Survey. You do need to check the top of wall elevations to make sure the district accounted for any concrete gutters placed behind the top of the wall. These are necessary if the slope of the fill will direct water towards the top of the wall. The district should decide whether to use Type A or Type B gutters (Standard Plan 609.00), or Modified Type A or Modified Type B gutters (Standard Plan 607.11) if fencing is required, and where they should drain to. You will also need to set the elevations for the top of the footing, which should be a minimum of 2 ft. below the finished ground line for walls south of Interstate 70 and 3 ft. below the finished ground line for walls north of Interstate 70. In tight roadway situations where a barrier curb is to be placed on top of the wall, make sure that a stem thickness of 16 in. will fit. Check with the district contact to determine if they want any coping on the exposed face of the wall. French drains will be used to relieve water pressure behind the CIP wall as a default. If you expect to encounter springs or swampy conditions, then check with the district contact on calling for an underdrain. If the decision is made to use an underdrain, the porous backfill and pipes are Roadway Items and this must be noted on the Bridge Memorandum and Design Layout. For details on requesting soundings, see EPG 751.1.2.20 Soundings (Borings). If you have indications that the foundation material is very poor in quality (less than 1 ton per sq. ft. allowable bearing), consider piling and include in the Preliminary Cost Estimate. Preliminary cost estimating should follow EPG 751.1.2.18 Preliminary Cost Estimate and be based upon unit price bid history. More refined cost estimating should follow cost-basing estimating. This page was last modified on 8 February 2019, at 15:57.